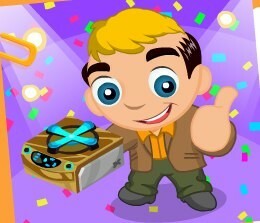 Buck Bradshaw is back in Cafe World, and he's asking you to cater his release party for the Bronze Stove. This comes by way of a new catering order called (appropriately enough) "Cater the Bronze Release Party." This one comes with a new exclusive recipe for you to earn, but don't think that you'll get it easily. 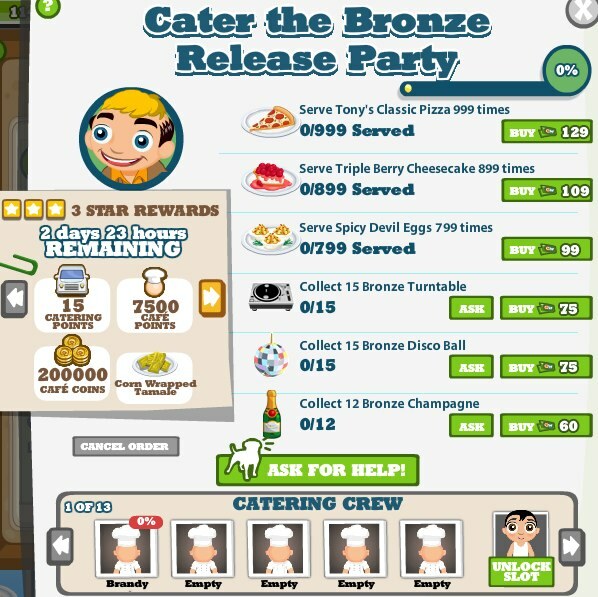 For the cooking tasks, you'll need to serve Tony's Classic Pizza (a five-hour dish) 999 times, Triple Berry Cheesecake (a 12-hour dish) 899 times and Spicy Devil Eggs (an 18-hour dish) 799 times. These are some incredibly hefty cooking requirements, so even with the ability to bring up to 12 friends in on this order with you, you'll want to make sure and have a full set of items ready to serve on your stoves before ever starting this order. This way, you'll get quite a few dishes out of the way within seconds of starting the order. Will this make this entire order easy to complete? No way, but it will give you a boost in the right direction. In addition to these cooking tasks, you'll also need to ask your friends to send you 15 each of Bronze Turntables, Bronze Disco Balls and Bronze Champagne bottles. If you can finish all of these tasks within three days, you'll receive three-stars, 15 Catering Points, 7,500 Cafe Points, 200,000 coins and the Corn Wrapped Tamale recipe. This recipe is only available by finishing this order with three stars, so make sure you're ready and able to take on the full requirements of this order before starting it out. If you can't finish within three days, but can within five, you'll receive 10 Catering Points, 5,000 Cafe Points and 125,000 coins. Finally, if you finish at any point after the first five days have passed, you'll receive 5 Catering Points, 3,000 Cafe Points and 75,000 coins. There doesn't appear to be a time limit for how long you'll have to actually attempt this catering order, but as usual, the earlier you tackle it, the more likely you'll have neighbors that are still working on it as well, and will therefore be ready and willing to help you out. Either way, we wish you good luck in finishing this order with the three-star rating; I have a feeling you're going to need it. What do you think of this particular Catering Order in Cafe World? Have you given up on completing Catering Orders altogether due to their increased difficulty? Sound off in the comments.